» home » magazine » 2017 » april 2017 » auto forecast: glass half-full or half-empty? Auto Forecast: Glass Half-Full or Half-Empty? Photo courtesy of Ford Motor Co.
A record 2016 saw 17.55 million new passenger vehicles sold, pushed by strong December sales. But in that impressive number, the New York Times sees cause for concern. December 2016’s numbers were boosted by huge buyer incentives. The thought is that after seven years of growth—including last year’s eclipse of 2015’s numbers, which served as the previous record—perhaps the cycle has peaked. 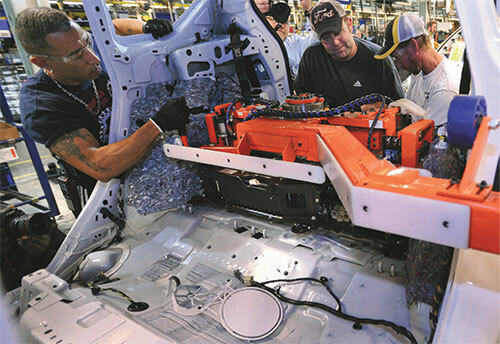 Employees attach electric parts at Ford's Flexible Michigan Assembly Plant. Here, flexible work stations allow assembly of multiple powertrains on a single line. Flexible manufacturing has implications for parts providers in terms of lot sizes, variety in part families and just-in-time production. Photo courtesy of Sam VarnHagen, Ford Motor Co. This should not be read as doom and gloom…read it as uncertainty. Because even with so much up in the air, for the third year in a row more than 17 million vehicles are expected to be sold in the United States in 2017, according to the National Automobile Dealers Association (NADA). Szakaly forecasts momentum in auto sales throughout the year and perhaps a second-half surge, aided by economic growth, cheap gas and a general settling down after surprise election results. Others also see the potential for growth in auto sales. Morgan Stanley forecasts 2 to 4-percent growth in 2017; Germany’s Center for Automotive Research sees 2-percent growth in U.S. sales if President Trump’s plans for economic stimulus and tax cuts come to fruition. On the other hand, BMI Research sees sales falling by 1.8 percent owing to a cyclical plateau and rising U.S. used-car stocks. Fifty years back, the pages of MetalForming’s predecessor, Metal Stamping, illustrated mandated safety standards for the typical 1968 passenger vehicle, a first for the automotive industry. The standards resulted from the National Traffic and Motor Vehicle Safety Act of 1966, enacted in a whirlwind manner after lawyer and consumer activist Ralph Nader the previous year published “Unsafe at Any Speed,” a critique of the U.S. auto industry. The act empowered the federal government to set and administer new safety standards for motor vehicles and road-traffic safety. Signed into law in September 1966, the act outlined the first mandatory federal safety standards for motor vehicles, and created the National Highway Safety Bureau (now National Highway Traffic Safety Administration). 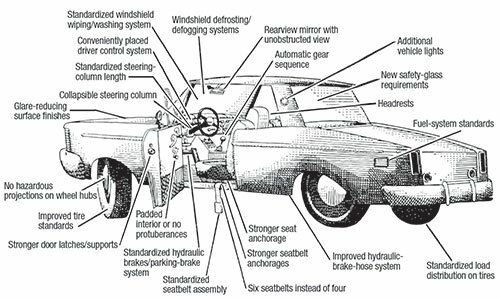 The safety standards became mandatory for automakers in their 1968 models, an incredibly short timeframe given that the standards would become finalized on January 31, 1967. That left little time to formulate them, and not much longer for their implementation in the 1968 models. 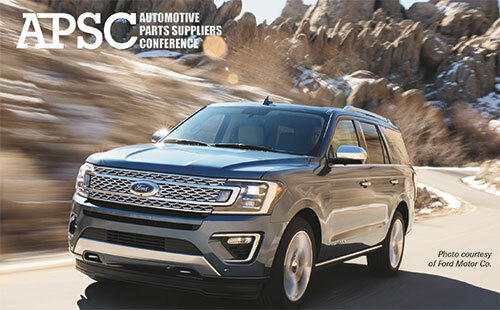 In a sometimes-contentious process, the Automobile Manufacturers Association’s newly formed Safety Standards Committee assisted government officials in drafting and reviewing the standards, with the final result leaving both industry and safety advocates somewhat unhappy. Today, vehicle safety and the role of government in automotive-industry issues (trade deals and CAFÉ standards, for example) remain hot-button topics…and trends that most likely will forever keep trending. All of that said, at press time January 2017 sales have shown that a slowdown may be in the works. J.D. Power expects January new-vehicle retail sales to top out at 874,000 units, down 2 percent from January 2016, while total light-vehicle sales are expected to reach 1,125,900 units, a 1.8-percent decline. IHS Markit predicts the U.S. auto industry will sell 17.37 million vehicles in 2017, revised from an earlier-predicted 17.5 million. This is due in part to rising inventories and automakers’ use of incentives. Engaging Employees—Building a Culture of Continuous Improvement, a presentation on workforce development and its role in producing better products and a better company, by Alfredo Alonso of Dana Corp. The Clock-Speed Dilemma, exploring how different clockspeeds exist between the innovation and product development cycles of car hardware, information-and-communication-technology (ICT) hardware components and ICT software, and how that hampers the process, by Gary Silberg of KPMG. Top Legal Issues Facing Automotive Industry in 2017 and Beyond, focusing on legal and regulatory issues affecting the automotive supply chain, by Dan Sharkey of Brooks Wilkins Sharkey & Turco PLLC. President Trump, the Automotive Sector & NAFTA 2.0, assessing the effect of the current political and regulatory climate on the auto industry, by David Hamill and Birgit Matthiesen, Arent Fox LLP. AIAG NexGen of Core Tool Software, a discussion of industry-specific quality tools, by John Cachet of PeProSo LLC. In addition, ERP-software provider IQMS will present a manufacturing case history. For details on APSC 2017, visit www.pma.org/apsc. Blockchain—The Auto Supply Chain’s Future? An industry-forecast discussion wouldn’t be complete without touching on a unique and somewhat mysterious development: a new trust protocol for the automotive supply chain? That is the promise of blockchain technology, according to its adherents. Get set to hear more and more about blockchain and its potential across the automotive spectrum. Blockchain is the technology that enabled the bitcoin Internet transaction model in 2009. Here, without any third-party institutions involved, transactions could take place anonymously and securely. The capabilities and performance demonstrated in the bitcoin setting have convinced many that blockchaining can work in any transaction/trade setting. A blockchain, as defined by a recent article in Harvard Business Review, is "an open, distributed ledger that can record transactions between two parties efficiently and in a verifiable and permanent way. The ledger itself can also be programmed to trigger transactions automatically." Each transaction is a timestamped block that cannot be edited after the fact, resulting in verified transactions. One industry in particular, the automotive industry, has been identified as an ideal setting for blockchaining. “If each auto part were assigned a unique code, blockchain would enable auto manufacturers to track each step of the production and transportation process through a secure database updated by suppliers in real time,” blogs Mahbubul Alam, with Movimento Group, a provider of over-the-air software lifecycle and data-management services to the automotive industry, and recently acquired by Delphi Automotive. “Each part with its robust digital identity is visible in this tracking system. The OEM and suppliers have encrypted records within the ledger, which makes it easy to identify an incorrect or fraudulent part. No other approach creates such an open, all-in-one system that establishes trust and identity without intervention.